Do you have a minute to spare to learn some English? 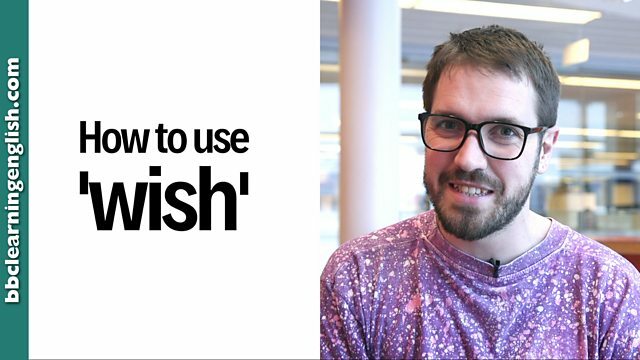 Watch Tom explain exactly how to use the verb 'wish'. Give us 60 seconds and we'll give you the English! Hi, everyone. Tom here, from BBC Learning English in London. And today, I'm going to tell you what to say after the word wish. When we're talking about wishes, we're talking about situations that are imaginary or unreal. To show this, after saying 'I wish', we use the past to talk about the wish, which is in the present. So, I could say: I wish I had a cup of tea. Ah, thank you! Now, if we want to make a wish about the past, we need to use the past past - or the past perfect. For example: I wish I had chosen a more formal shirt before I filmed this video today. When we want to make a wish about a present situation, we use wish and a past simple or continuous verb. I don't have my umbrella. I wish I had my umbrella. She doesn't know the answer. I wish she knew the answer. You're at work, but you wish you were playing football, right? When we want to make a wish about a past action or situation, we use wish and the past perfect - had + past participle verb. I'm so tired. I wish I had slept for another hour last night. She knows she made a mistake. She wishes she hadn't been so silly. You were right. I shouldn't have quit my job. I wish I had listened to you. We only use 'wish' with situations that are either real, or unreal. But which is it? In which situations do we use the verb 'wish'? If it is too hot today, we need to make a wish about the present. The weather is too hot today. What do I wish? If you dropped your phone yesterday, we need a past wish. I dropped my phone yesterday and now it's smashed.